Following our dramatic penalty shoot-out victory over Lowestoft Town in the 3rd Round of the CSS League Cup, we will now face Berkhamsted FC in the Quarter Final. This game will be played at Garden Walk on Tuesday 12th February, kick off 7.45PM. 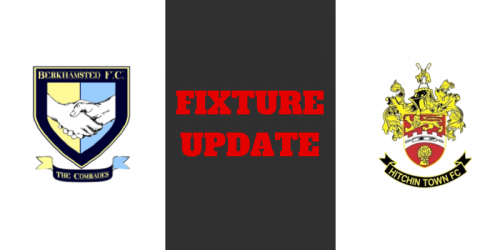 However, this means that our scheduled Hertfordshire FA County Charity Cup Semi Final away to Hitchin Town, scheduled for Wednesday 13th February will now need to be rearranged. The new date for this fixture will be announced shortly. Keep an eye on here, our Facebook page or Twitter feed for more details.